I didn’t skip out on my goal of finishing a project this week; I’m just a bit late in getting up a post about it. I got an assist from one of the Writing Center tutors this week as I finished up the binders that will organize our resources on the tables, so we can have easy access to them. This project actually started about 3 years ago when two of the Writing Center tutors started creating resources for use around the Writing Center. We wanted a standardized way of explaining concepts, and we wanted samples that we could copy over and over again without violating copyright laws. The tutors actually got to show off their work at the regional writing center conference, making me one proud director. As we moved to our new space and got busier, I decided it was time for the resource notebooks to get a facelift. I decided to recycle old training binders that the tutors had personalized for themselves with sharpies. 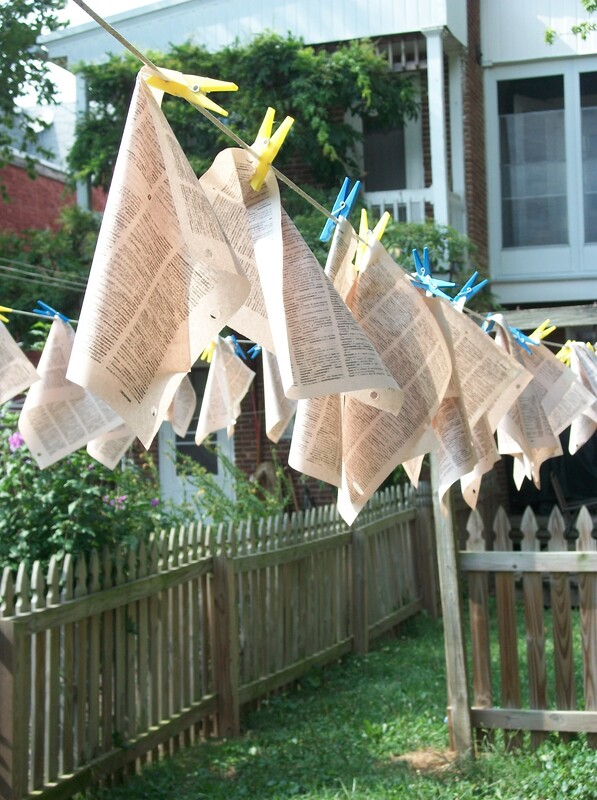 The first step was hanging a dictionary out on the clothesline. I did this after I tea stained the pages by soaking them quickly in baking dishes of tea. If I ever do a project like this again, I’ll skip the tea staining. The pages were already of newsprint feel and color, which would have been fine for the project. So, other than a pretty cool picture, all I got for this effort was lots of mosquito bites. Then, I enlisted the help of a friend and the tutors last semester to try to get the tea stained pages modge podged onto the binders. Well, sorta modge podged. We were working on a tight budget, so I tried to use the cheapo version of Modge Podge so popular on Pinterest – the one made out of Elmer’s glue and water. The end of the post will have some project that worked using that, but I do not recommend cutting corners when attaching newsprint to non-pourous binders. The process was laborious; pages stuck poorly and had bubbles throughout, and the binders felt gritty and dirty when dry. and the books no longer feel dirty. Project for the week, completed! Notice our cool scrollwork wall hanging in the background. One of the tutors and I cruised around to yard sales to find some decor, and we scored that beauty for $22. It took some creative maneuvering to fit it into the car because it’s solid metal and quite large, but the adrenaline from our good deal helped. The only way we could have gotten something like that cheaper would have been to go steal someone’s garden gate, which would have been frowned upon by administration. 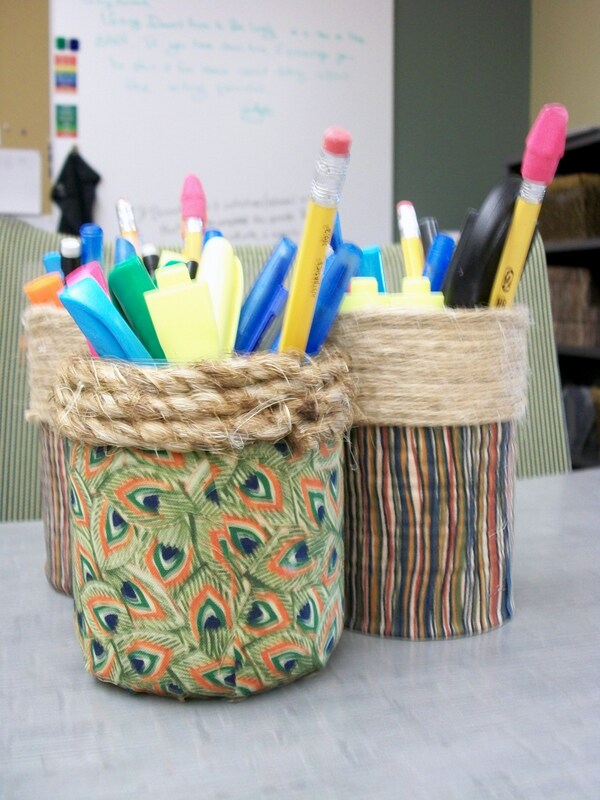 Here’s a fake Modge Podge project that did work out well, our pencil holders. I used fabric on salsa jars and tin cans and then dressed up the top of the containers with twine since my last experiments with twine worked out pretty well. I’m partial to salsa jars for pencil holders. I think they are the perfect size. 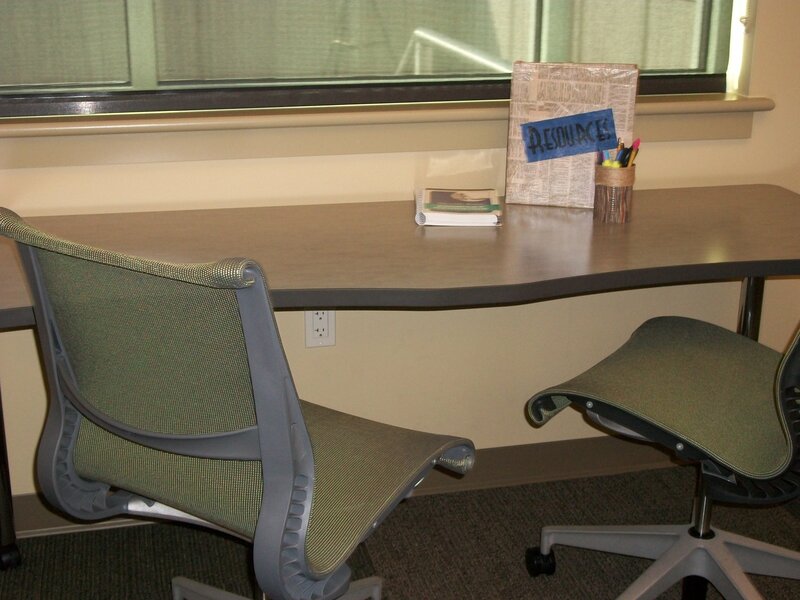 I’m also glad that when the Writing Center was being designed I asked for a whiteboard behind the reception desk. As you can see in the background, it’s a veritable Grand Central Station of notes that we all leave for one another to help make sure everything keeps running smoothly. When we moved into the Writing Center, we had two great bookshelves and no desk drawers. The problem is we have more office supplies than books. So, I went and bought the photo boxes that go on sale 5 for $10 at A.C. Moore and Michaels. We used fabric and fake Modge Podge on them as well, and they have been quite durable so far. I like how we were able to customize them to the space. Given our lack of books, we needed more filler on the shelves, so on our yard sale excursion we picked up a bunch of hardback books for ten cents each, and I spray painted them rust colored. Spray painting books may sound easy; it is not. If anyone else is ever crazy enough to try, here is my advice. First, don’t. But, if you do, then take the time to prime the books before applying color. I didn’t. And, have plenty of newspaper and masking tape on hand so you can cover the edge of the pages. And, yes, I know that fern is not looking so good; one of the tutors is trying to nurse it back to health. It goes against the Writing Center philosophy to give up on struggling things — even plants. 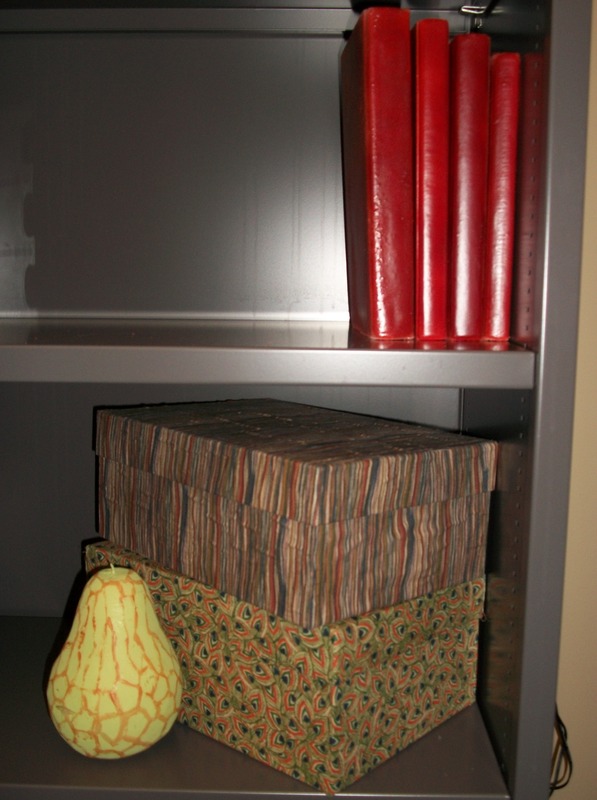 Here’s a close-up of our highly customized bookshelf vignette. 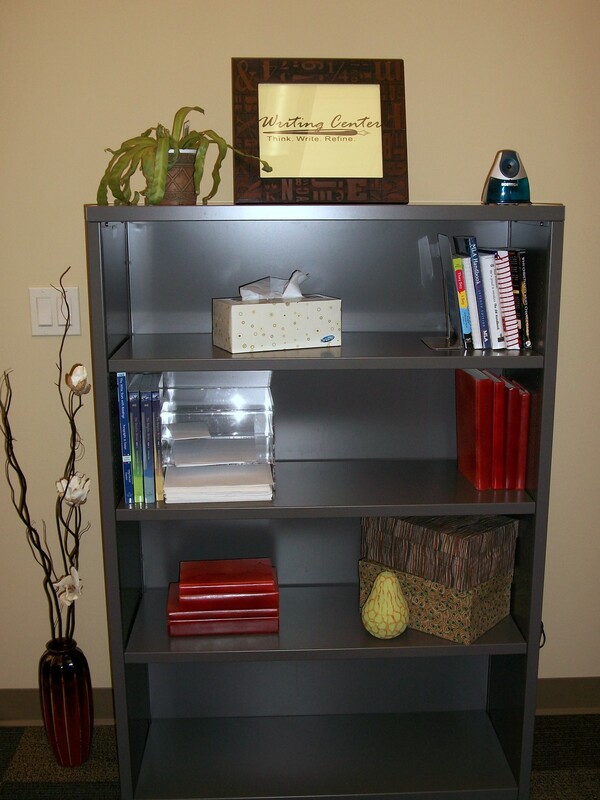 Once we put the binders and pencil holders together, here’s a look at one of our tutoring stations. Those green chairs are amazingly comfortable; I’m surprised they don’t induce more people to make one hour visits. 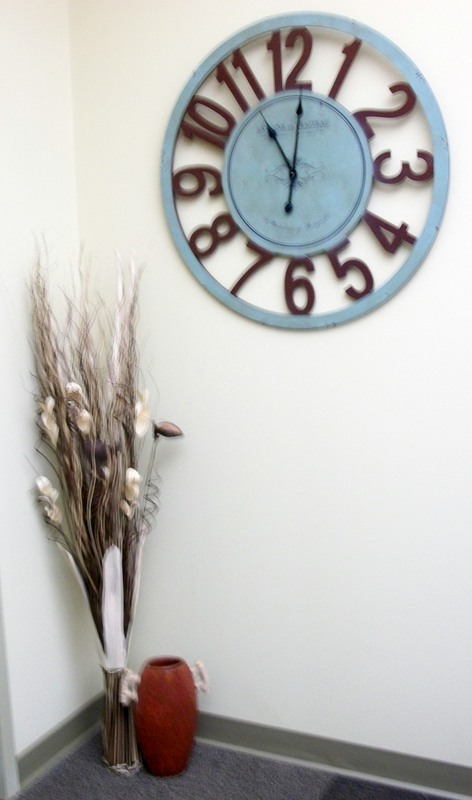 Just in case someone only has 30 minutes, here’s our clock to help us keep track of time. This one was a steal at $30. It’s the perfect size for the corner and color coordinates with our space so well. 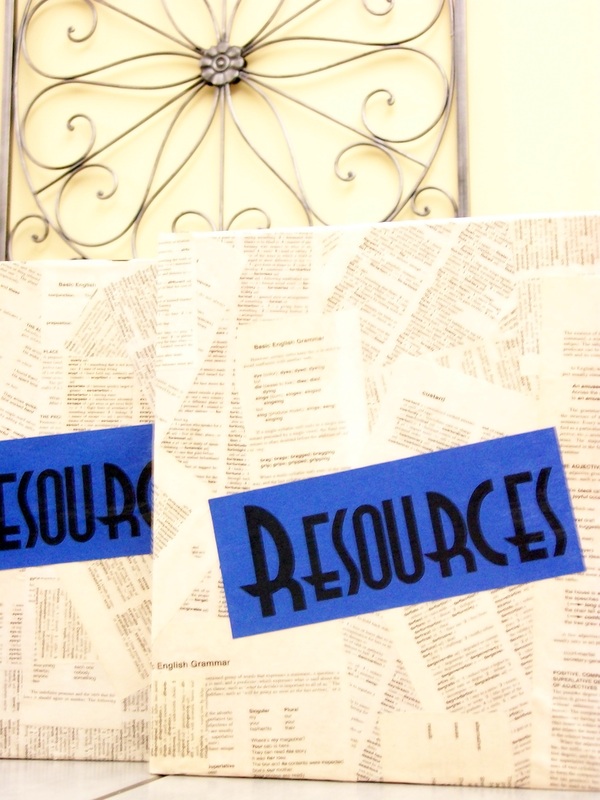 This entry was posted in decorating and tagged Modge Podge, Project 2013, Writing Center. Bookmark the permalink.